Pandit Deendayal Petroleum University Recruitment 2019: Pandit Deendayal Petroleum University (PDPU) / www.pdpu.ac.in is conducting recruitment processes to fill new vacant positions. As of now, there is one recruitment drive going on for Faculty Posts. 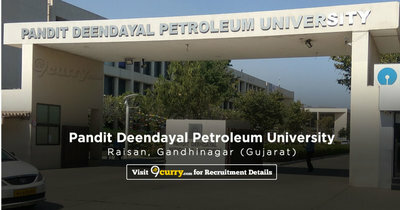 Pandit Deendayal Petroleum University Recruitment 2019 - Apply Online for Faculty Posts in Pandit Deendayal Petroleum University, Gandhinagar, Gujarat. Online Applications are invited by Pandit Deendayal Petroleum University (PDPU) from 12 Apr 2019 to 02 May 2019 06:00 PM.